Which are useful nutrients of pistachios and what can help us in the diet. Pistachios, along with other nuts like almonds, walnuts and hazelnuts are known for their beneficial properties and high nutritional value. Here are more benefits than regular snack on pistachios? Study, led by Professor Penny Kris Eterton University Penn State, found that when you eat daily from 50 to 100 grams. Pistachio, lowers the blood pressure, if we are in a state of stress. A lowering of blood pressure is associated with a reduced risk of developing heart disease or stroke. Pistachio reduces triglyceride levels that are bad fats that can accumulate in the arteries and cause heart disease. If your daily menu includes regular intake of these nuts can be reduced and chronic inflammation, which in turn will reduce the risk of developing diabetes and heart disease. Diabetic medicine will be included in the fight against obesity. Better 10 euros for vaccine instead of 100 euros for drugs. Pistachios are one of the highest fiber content of all nuts, they can provide 12 percent of your required daily intake of fiber. It is advisable to take about 14 grams of fiber per 1,000 calories. Regular consumption of fiber helps us to lose weight and control blood sugar levels. Fiber can also reduce your cholesterol and contribute to the proper functioning of the intestines. 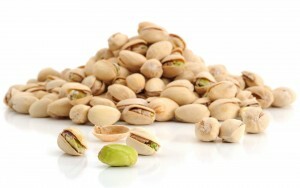 Pistachios can be useful for people with diabetes, a study of others. Cyril Kendall and Dr. David Jenkins of the University of Toronto. 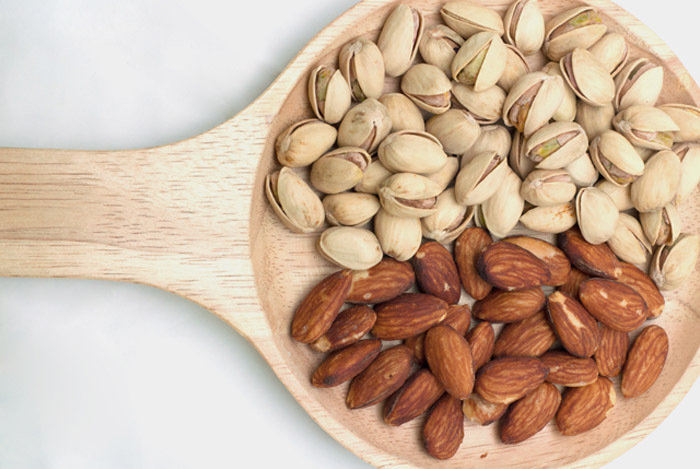 When we eat pistachios high carbohydrate foods, they actually decrease the rate of absorption of carbohydrates in the body which can result in low blood sugar levels. The pistachio nut contains antioxidants such as lutein and zeaxanthin as well as vitamin E. Lutein and zeaxanthin protect the eyes and can reduce the risk of macular degeneration, which is one of the leading causes of blindness in the elderly. Eating just 60 grams. Pistachios a day can also increase the levels of vitamin E in your blood. Vital nutrients: 30 grams pistachios equal 170 calories. They contain about 2% of the daily value of vitamin A you, and other vitamins such as riboflavin, pantothenic acid, and niacin. They also contain 4 percent of your daily need for folic acid and biotin. Pistachios contain several important substances – Jamin, vitamin B6, manganese, copper, phosphorus, potassium and magnesium. They also contain the largest amount of polyphenolic antioxidants compared to other nuts.